With the VCP6-DCV certification you will be able to configure, administer and scale a vSphere virtualized data center. 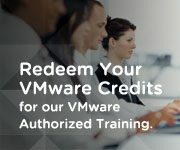 You can deploy, consolidate, and administer virtualization technologies including vSphere HA and DRS Clusters, storage virtualization using VMFS, Storage DRS and Storage I/O Control, network virtualization using vSphere standard and distributed switches and Network I/O Control, vSphere management using vCenter Server and vRealize Operations Manager Standard, and Virtual Machines. Gain experience with vSphere 6 (minimum 6 months recommended). Attend the vSphere VMware vSphere 5.5 to 6.7: What’s New (VIWN) training course. Complete the vSphere 6 Foundations Exam. Complete the VMware Certified Professional 6 – Data Center Virtualization Exam.